Champagne Tarlant is a family run Grower Producer with history back to 1687 when Pierre Tarlant began cultivating vineyards, and with the12th generation recently joining the business. The grapes are pressed traditionally and vinified separately plot by plot. The first fermentation is done using 60% oak casks and 40% temperature controlled stainless steel. A bare minimum of sulfur is used, there is no malolactic fermentation, and dosage (sugar added after disgorgement) is kept to a minimum. In fact, as of 2012, 80% of their wines have zero dosage. Admittedly, zero dosage is somewhat of a fad, and I am not an enormous fan of zero dosage in general. There is a reason for dosage in Champagne where the weather is cool and grapes do not ripen as fully as in say California. Champagne is acidic, dosage can balance the wines, as well as hide any flaws (let's just say less than perfections). Zero dosage proponents would argue that the wines are purer and more representative of their respective terroirs. Both camps are correct, and let me just say that Tarlant's zero dosage wines simply rock - they do it right! Their vines are all in the Vallée de la Marne and are made up of 55 parcels of vines spread over 14 hectares in the villages of St-Agnan, Boursault, Celles-les-Condé, and Oeuilly. It's fascinating that their grapes include the expected Chardonnay, Pinot Noir, and Pinot Meunier as well as small amounts of the historic grape varieties of Arbanne, Petit Meslier and Pinot Blanc. Tradition - a black grape dominant blend, currently 55% Pinot Noir, 35% Meunier and 10% Chardonnay, with a dosage of 6 gram/liter and described as a "magnificent food wine." Reserve Tarlant - 1/3 each of Pinot Noir, Pinot Meunier, and Chardonnay with 6 grams/Liter dosage. 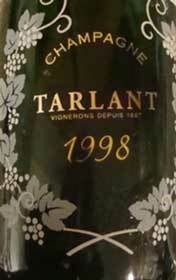 Rose Tarlant - a white grape dominant blend with 85% Chardonnay and 15% Pinot Noir. La Vigne d'Antan - a fascinating 100% ungrafted Chardonnay as in pre-phylloxera days from supposedly the only terroir where Chardonnay can grow ungrafted on its own roots. 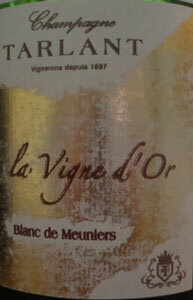 Vinified in oak barrels with no malolactic fermentation and grapes from "Les Sables" in Oeuilly. La Vigne d'Or - a 100% Pinot Meunier, over 50 year old vines, from "Pierre de Bellevue" in Oeuilly, an exceptional terroir. Tasting note below. QV Discobitch - Made for Paris based DJs Laurent Konrad and Kylian Mash. Currently the same as the Brut Nature "Zéro," but with the addition of a six-gram dosage. K & L wines likes it a lot and says "Bitchin' for parties" and I trust them! Zero Brut Nature - 1/3 each of Pinot Noir, Pinot Meunier, and Chardonnay with zero dosage. See the tasting note below. Rose Zero Brut Nature - 85% Chardonnay 15% Pinot Noir with zero dosage. Some people report that it may need a year after release to really show well, but I haven't tried it yet. It has been described as full of bright, wild red fruit aromas with lots of minerals and bracingly dry. Prestige and Rose Prestige - their vintage (mostly Chardonnay with Pinot Noir - varies depending on year) and rose vintage (85% Chardonnay and 15% Pinot Noir) wines. Cuvee Louis - This is their Tete de Cuvee named after the first Tarlant to make Champagne with the name Tarlant on the bottle. From the chalkiest portion of the Tarlant family's hillside vineyards in Oeuilly, it is half Chardonnay and half Pinot Noir. Disgorged Sept 2009. 65% Chardonnay and 35% Pinot Noir. 4grams/liter dosage. The nose starts with seashells, followed by earthy lemon, a lovely maritime quality. Oodles of chalk with air. The palate is immediately lemony and creamy. Bright and friendly. Minerals on mid palate and end. Touch of tangerine. rated A- These people do zero dosage right! The nose starts with delicate lemon. It's light and airy with some orange peel and wonderful stony limestoney minerals. On the palate there are some diffuse citrus notes, excellent purity and minerality. Surprisingly sweet for a zero dosage with exquisite balance. Finishes quite dry. 100% Pinot Meunier (Blanc de Meuniers) from over 50 year old vines. I am not the biggest fan of 100% Pinot Meunier wines, although I have drank several interesting and fun ones. In general, I consider them "fun" rather than "serious" wines and usually after a glass or two I'm bored and want to drink something else. This wine is perhaps different - read on! The nose is very fresh apple, pair, spicy minerals, and menthol. Big & festive and fruity tasting with lots of apple on the end. Very long and plenty of minerality. This is very balanced and fun - it's fresh and pure.